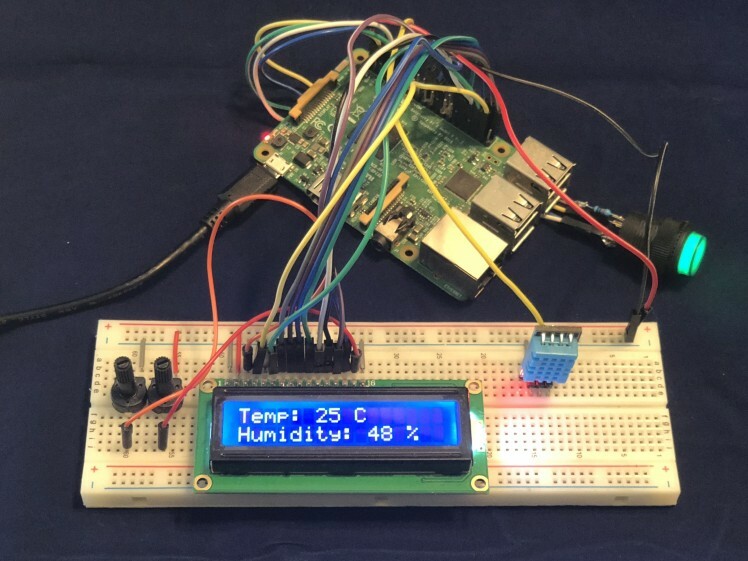 This very simple protip connects an LCD to a Raspberry Pi to display any data you need, like readings from a temperature sensor. 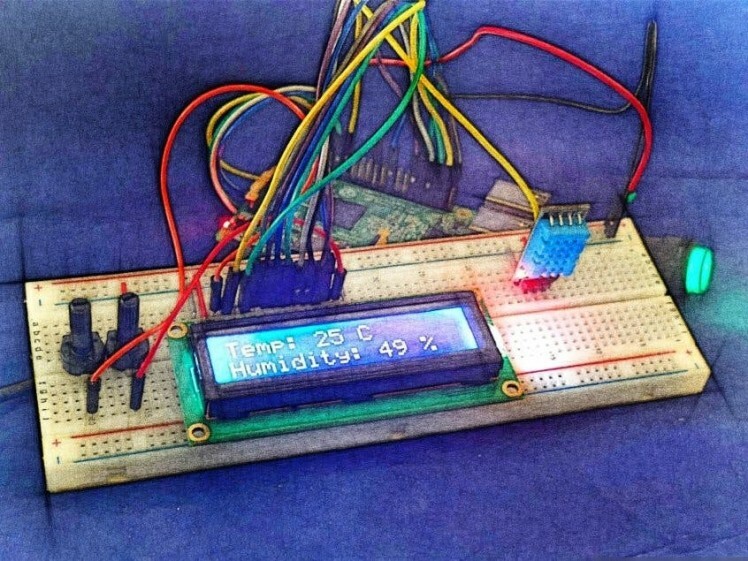 LCD is a very useful add-on to any project. 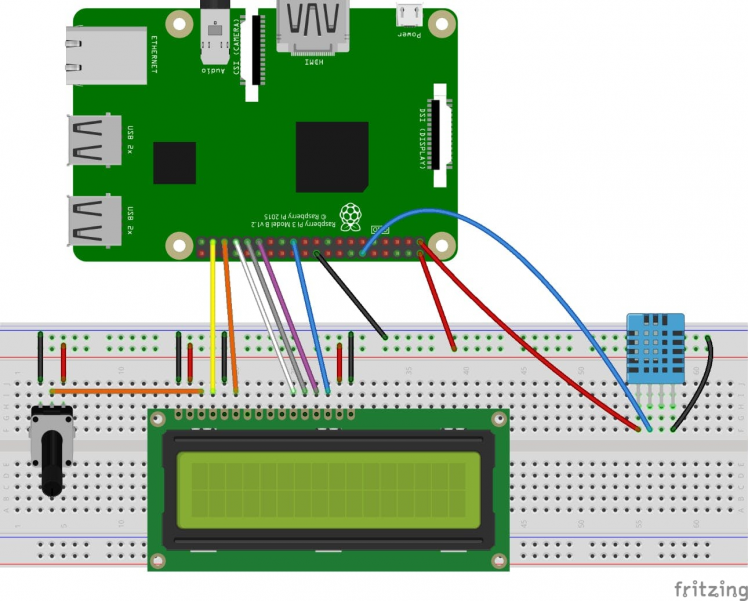 This very simple protip connects LCD to Raspberry Pi to display any data you need. In our case, we will display readings from a temperature sensor. Will not steal the only serial port on the Pi. We will have couple options connecting LCD screen: simple 4 bit connection with one potentiometer to handle contrast and brightness and a bit more complex 8 bit connection with advanced control over contrast and brightness with 2 potentiometers. The potentiometers can also be replaced with 1K or 3K Ohm resistors. Each character and command is sent to the LCD as a byte (8 bits) of data. So in 4 bit mode, the byte is split into two sets of 4 bits which are sent one after the other over 4 data wires. In theory 8 bit mode transfers data twice as fast as 4 bit mode, since the entire byte is sent all at once over 8 data wires. However, the LCD driver takes a relatively long time to process the data, so no matter which mode is being used, you will not notice a real difference in data transfer speed between 8 bit and 4 bit modes. 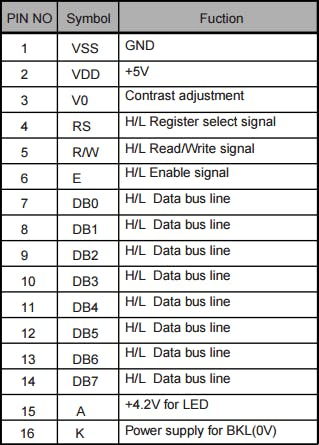 The data pins (DB0-7 pins 7-14) are straightforward. They are sending data to the display (toggled high/low). We will only be using write mode and not reading any data. The register selectpin (RS pin 4) has two uses. When pulled low it can send commands to the LCD (like position to move to, or clear the screen). This is referred to as writing to the instruction or command register or to send data to the screen. The read/writepin (R/W pin 5) will be pulled low (write only) as we only write to the LCD in this protip. The enablepin (E pin 6) will be toggled to write data to the registers. Now we have 2 potentiometers: left one is responsible for contrast and right one is responsible for brightness. You may noticed we removed 5V wire (red one) from contrast potentiometer as there is no need in additional voltage handling because we have second potentiometer responsible for brightness. 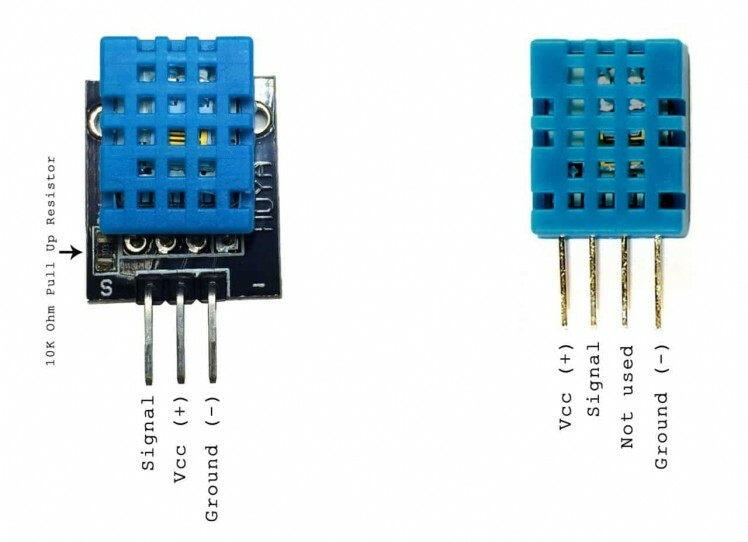 DHT11 sensors can have 3 or 4 pins options however it does not matter as it uses only 3 pins to read the data in any case, if you have 4 pins sensor you need to connect only Vcc, Signal/Data and Ground pins and ignore the 4th one. On schematics above you can see 4 pins sensor connection. DHT11 sensor requires from 3.3V to 5V. First, let's connect DHT11 sensor to 3.3V Raspberry Pi pin 1 if it works this voltage is enough if readings are weird or there are no readings at all try connecting it to 5V Raspberry Pi pin 2. This protip uses 3.3V. So far so well, after we connected Vcc and Ground pins we need to wire sensor's signal connector to Raspberry Pi physical pin 12 (GPIO 18). Before we proceed to the exact coding we need to double check if we have required libraries for display and sensor and install them if they are missing. We are going to use Python to program our display and sensor. I use Visual Studio as IDE but you can use anything else you prefer to work with. First, we need to connect to the Pi via SSH (with PuTTY for example). Then, we'll use a script called temperature.py. Then, paste the following code (8-bit option) into that file, and press CTRL-X to exit, and Y to save when prompted. 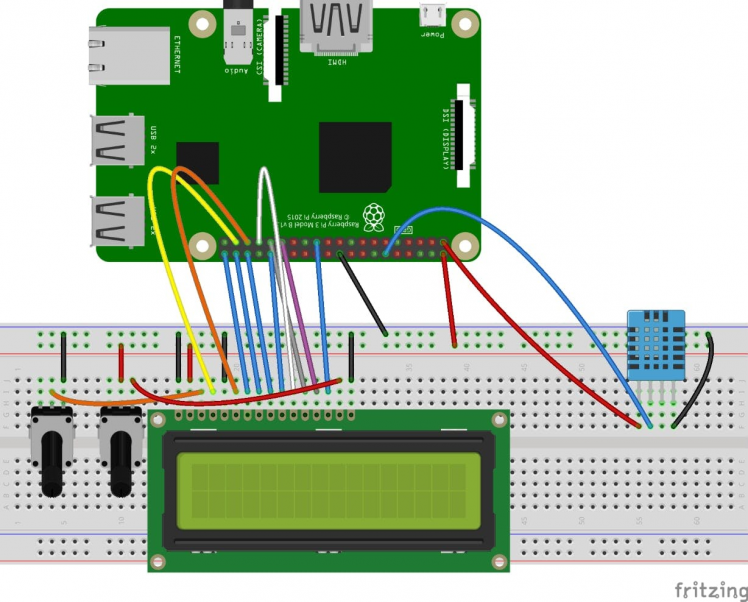 The example above uses 8-bit connection option with Raspberry Pi’s physical pin numbers for LCD display, not the BCM or GPIO numbers. I’m assuming you have your LCD connected the way it is in the diagrams above, but you can always change pins in case you need. Simple 4-bit connection code is attached in Code section. Please read comments in code, to get better understanding of what is going on. Alternately you can download ready to use code from Git repository provided in Code section. Hardware done, coding done, now we need to auto-run our display and sensor script on Raspberry Pi boot. I will describe the best one (at least from my point of view). You can check other options to run this automatically on boot here. If your command runs continuously (perhaps runs an infinite loop) or is likely not to exit, you must be sure to fork the process by adding an ampersand to the end of the command. Otherwise, the script will not end and the Pi will not boot. The ampersand allows the command to run in a separate process and continue booting with the process running. Be sure to reference absolute filenames rather than relative to your home folder. You apparently don't need the sudo here, since rc.local runs as root. That's it, we all set, restart your Raspberry Pi and check how it works. You could notice a green shining button which plays role of power on and off switch. If you are interested in how to implement it you can check this article. I hope reading this article was worth it and gave you some insight how you can enrich your project with installing LCD to display any data you need! Simple 4bit connection circuit diagram with one potentiometer to control contrast and brightness. 8bit connection with advanced control over contrast and brightness with 2 potentiometers.